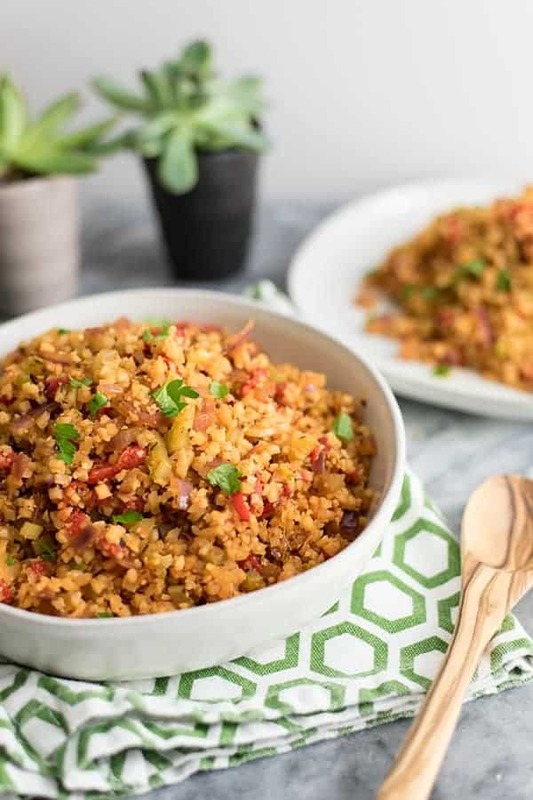 Dinner just got a little bit yummier with this easy grain-free Whole30 Cauliflower Dirty Rice. It’s ready in about 15 minutes and is so packed with flavor you are going to go back for seconds! 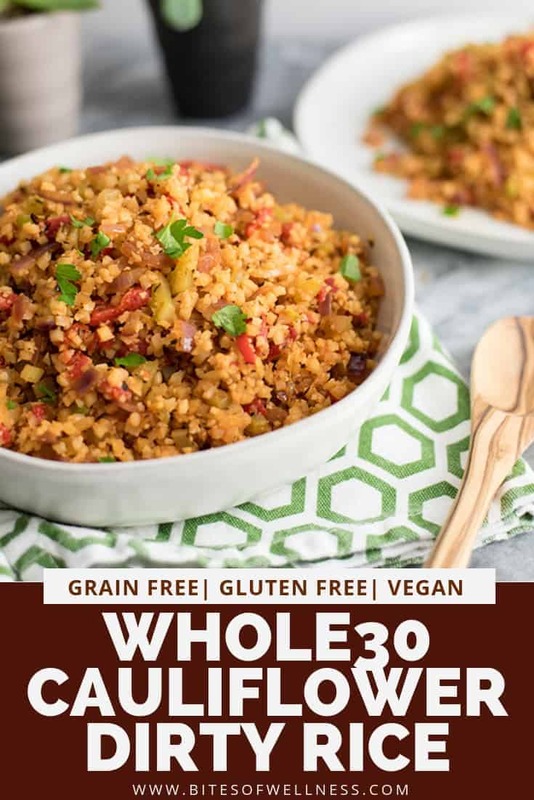 Oh and it’s Whole30 approved, grain free, gluten free, vegan, and low carb! Growing up I used to LOVE when my mom would make dirty rice from the box (you know with the spice packet). It was unlike anything else she made. Smokey, spicy and a big depth of flavor, I always remember going back to the kitchen and getting seconds or thirds (!!!!) on those nights! Some things don’t change! 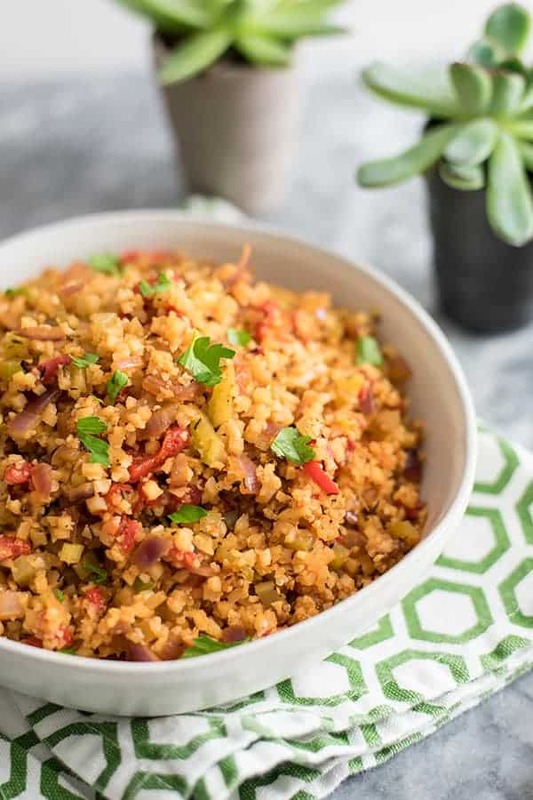 This grain-free whole30 cauliflower dirty rice has all the same bold flavors without any of the fake ingredients (and of course no rice either). All you need is a few bags of frozen riced cauliflower, or a head of cauliflower and a food processor! I see riced cauliflower in the frozen section at most grocery stores now. I always pick up at least 5 bags at Trader Joe’s since you know I love some riced cauliflower! If you do buy some extra riced cauliflower, you should make these amazing low-carb cauliflower bagels or apple cinnamon cauliflower oatmeal! I promise you will soon start seeing riced cauliflower as the perfect way to add more veggies into your diet! 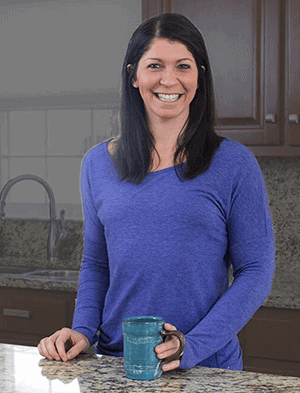 My goal is to create healthy, simple recipes so you can get dinner on the table in 30 minutes or less. 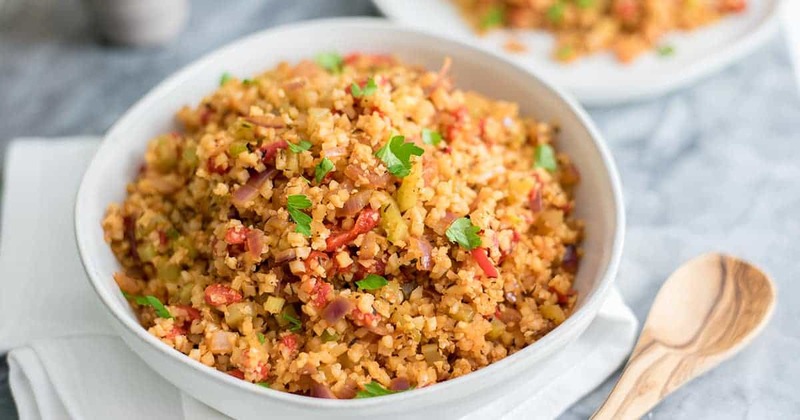 This grain-free cauliflower dirty rice easily meets that goal! All you need is some slow cooker shredded chicken, some 7 minute salmon or some red kidney beans or chickpeas if you are vegan or vegetarian! You can also intensify the spiciness of this dish by adding more cayenne or a dash or 10 of hot sauce. But just a pinch of cayenne was enough for me! Speaking of a quick meal. This grain-free Whole30 cauliflower dirty rice is the perfect make ahead dinner for busy weeknight, since it tastes even better the next day! 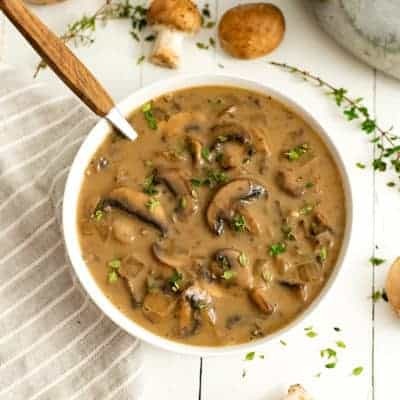 Be sure to add it to your Sunday meal prep as well, since you can easily double this recipe to enjoy it a few days in a row! Added bonus, if you don’t count the salt, it’s only 10 ingredients! I bet that most of these ingredients are in your fridge or spice cabinet right now! 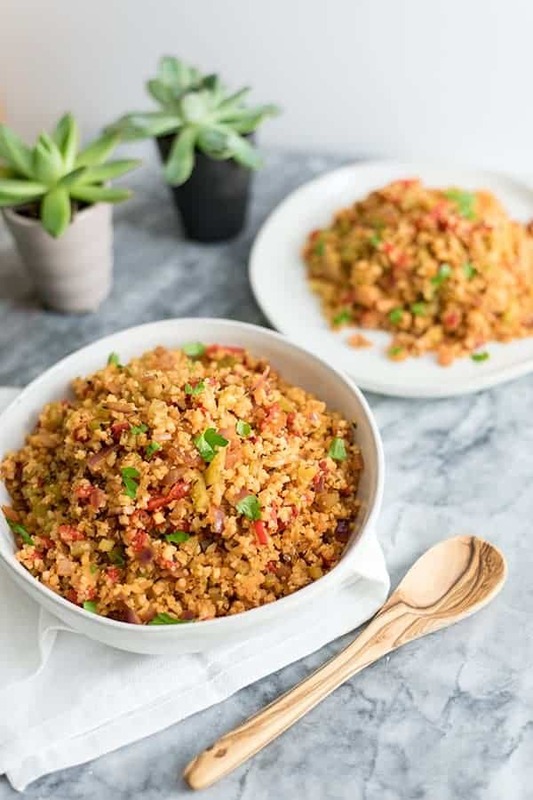 See how easy this Whole30 Cauliflower Dirty Rice is to make in the video below. Heat a large pan over medium heat. Add the avocado oil. Add the chopped celery and red onion to the avocado oil and saute 3-4 minutes. Drain and chop the roasted red pepper, add to the celery and red onion mixture. Stir well. Add the remaining spices and coconut aminos. Pour in the frozen riced cauliflower and stir well. Make sure to break up any large clumps. Cook 7-8 minutes until fully defrosted. I was recently diagnosed with celiac disease. I’m 26, so having to do an entire lifestyle change has been a bit overwhelming since all the food I had in my daily routine was basically no longer allowed to be a part of daily routine! Who would have thought that some of my “healthy” items weren’t actually good for me! Stumbling across your site and recipes has been amazing! It’s given me so many ideas and I’m so excited to actually cook & bake again. Thank you! How much is a can of roasted red peppers? I see them in all sizes. Hi MarjAnn! I usually use a 12oz jar! 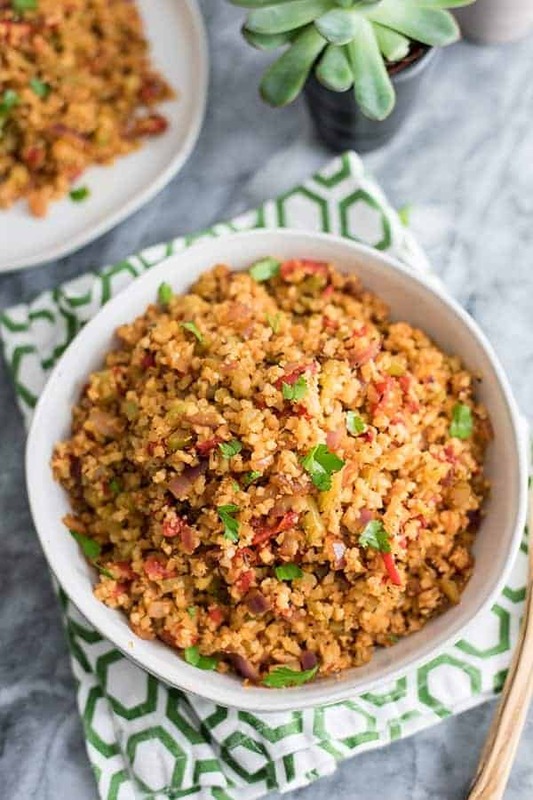 Cauliflower is on my must try list this year and I just pinned this so I can give it a whirl… feeling optimistic because this looks so delish! It’s a must try! Excited for you! 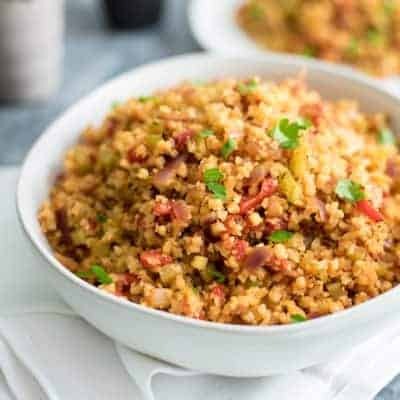 Great take on dirty rice! 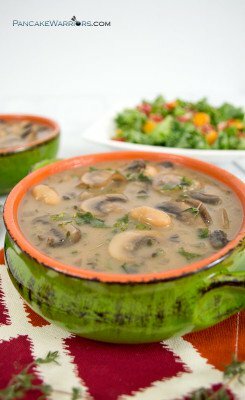 I love that you used cauliflower! Healthy, flavorful and delicious—cannot beat that trio!! !